When showing people around Rome I think it’s important to mention how we know what we do (& indeed whether that information can be trusted). I can tell you that the Colosseum was inaugurated with 100 consecutive days of games, or that a 120 ft statue of the sun god known as the Colossus stood in front of it, or show you a reconstruction of the Temple of Julius Caesar in the Forum but – you may wonder, and in your shoes I would, and indeed have – how do you know that? Sources are many and varied and one of the most useful things I was taught both at school and university was to question the source’s validity and accuracy. This skill is ever more important in the current age of the proliferation of unfiltered information (not least this blog). To quote a medieval source (Bede, Magister Gregorius) on the games at the Colosseum writing centuries after the last games were held is of course of great interest but tells more of medieval perception of Ancient Rome than of actuality. Indeed it is sometimes posited that Bede, like so many guide book writers, never even visited Rome. For a primary source on the inaugural games our thoughts more naturally turn to Martial, who was there. Yet, are we to believe every word of his colourful “Book of Shows”? Does the elephant which kneels before the Imperial box do so through the spontaneous perception of the Emperor’s supremacy? We can and should assume, therefore, a certain amount of spin and embellishment. As well as literary sources, numismatics are an important clue to the forms of ancient buildings: if we can deduce from the pile of rubble in the centre of the Forum what the Temple of the Divine Julius Caesar once looked like it is thanks to coins commemorating its dedication. Another incredibly important source of information of the layout of Ancient Rome is the Forma Urbis, a map of the footprint of all of the buildings in the city dating to the reign of Septimus Severus (early 3rd century). Circa 18m by 13m, it was carved on 150 slabs of marble, and originally hung on the wall of the Temple of Peace (today the wall is part of the monastery of Sts Cosma and Damien). About 10% of the map survives in the archives of the Capitoline Museums. The combination of the archeological remains, the Forma Urbis, & surviving literary sources provide a web of clues which can be pieced together. The day before yesterday was Rome’s 2769th birthday. Legend says the city was founded on the 21st April, 753 BCE. Which is extremely specific for a legend. I always feel one could add “at about half past three in the afternoon”. Forgive me if you’re more than familiar with the legend, but I thought I’d take the opportunity to rattle through it just in case you’d like reminding. The she-wolf in the magnificent Capitoline Museums, photo taken on Rome’s birthday. The story began in Albalonga, in the long extinct (even then) volcanic hills south of Rome. It was here that the good king Numitor, distant descendent of the Trojan hero Aeneas, ruled. However, as good kings so often do, he had a bad brother. The wicked brother did away with the good king and his sons, only sparing Numitor’s daughter Rhea Silvia. The princess was forced to become a Vestal virgin, a priestess of Vesta, and her chasteness would guarantee he would reign unrivalled. However Mars, god of war, had other ideas. He had his wicked way with Rhea Silvia and she gave birth to twin sons, Romulus and Remus. They had to be removed from the equation and the bad king’s henchmen had them abandoned in a basket in the river. The boys washed up in an inlet of the Tiber where they were found by a she-wolf who suckled them, and a shepherd called Faustulus brought them up as his sons. As they grew older they started arguing about who should be in charge. Romulus founded his settlement on the Palatine Hill; Remus, tradition says, on the Aventine. Their rivalry came to a head on that magical date, 21st April 753 BC (just before tea time). Romulus was thrown into a fit of rage by his brother, who mocked his fortifications of the Roma Quadrata. Remus was slain and Romulus became the unchallenged ruler of the city which would take his name, and Roma was born. There is a nicer and less bloody version, which says that Remus fled north and founded Siena. The band of the Polizia Penitenziaria playing the Italian national anthem in front of the goddess Roma at the Campidoglio. This year to celebrate the foundation of Rome, my father (visiting from London) and I took a spin around the ever splendid Capitoline Museums. We said hello to the she-wolf which is the symbol of the city (and indeed also of Siena), and watched a police brass band play the national anthem with panache. One wall of the Gallery of the Tapestries in the Vatican Museums is lined with wool tapestries telling stories from the life of Christ. They were woven in Brussels at the workshop of Pieter van Aelst in the early 16th century. Roman in design (they are the work of the group known as the New School, what remained of Raphael’s workshop after his untimely death), and Flemish in manufacture they were part of an elaborate and expensive pan European project, befitting their role decorating the lower levels of the Sistine Chapel. They were first hung in 1531 over the painted faux drapery of the lower register of the side walls of the Chapel; astonishing to think that there was once even more to look at. The second tapestry on the left as one enters the Gallery depicts the Adoration of the Magi and it is my favourite for a couple of details. Crowding around the rather large infant Christ (he is after all twelve days old) are a collection of exotic animals. On the left a couple of rather fabulous camels which were clearly designed by someone who had never seen a camel. They are, I often think, the result one might achieve if working from a description recounted by a slightly sozzled chap in a pub whose cousin had seen one. In the background however is an altogether more anatomically (if not geographically) accurate beast: an elephant. The artists who drew it had quite probably had the opportunity to sketch an elephant from life. A decade or so before the tapestries were designed an elephant called Hanno had lived, briefly and one imagines unhappily, in the Vatican. He was a gift to Giovanni de’ Medici following his installation as Pope Leo X from King Manuel I of Portugal (the perfect sixteenth century risposte to the question, “what does one get the man who has everything?”). Imported from the island of Sri Lanka, Hanno was ensconced in the Belvedere Palace (then the Papal summer residence above the modern entrance to the Vatican Museums). When he fell ill two years later, every effort was made to save the beast, including the administration of a gold enriched suppository. This, unsurprisingly, had little positive effect and Hanno expired on 8 June 1516. Sent as captive to Pope Leo X. And in my brutish breast they perceived human feelings. And had not the patience to let me serve my master a full three years. You will add to the life of the great Leo. He measured twelve palms in height. In the fourth year of the pontificate of Leo X. The story is told beautifully in The Pope’s Elephant by Silvio Bedini. This tapestry is seen on my Vatican City private tour. Mon-Sat 9 – 5.30 (last entrance 4.20). €16 entrance; €20 with priority entrance . 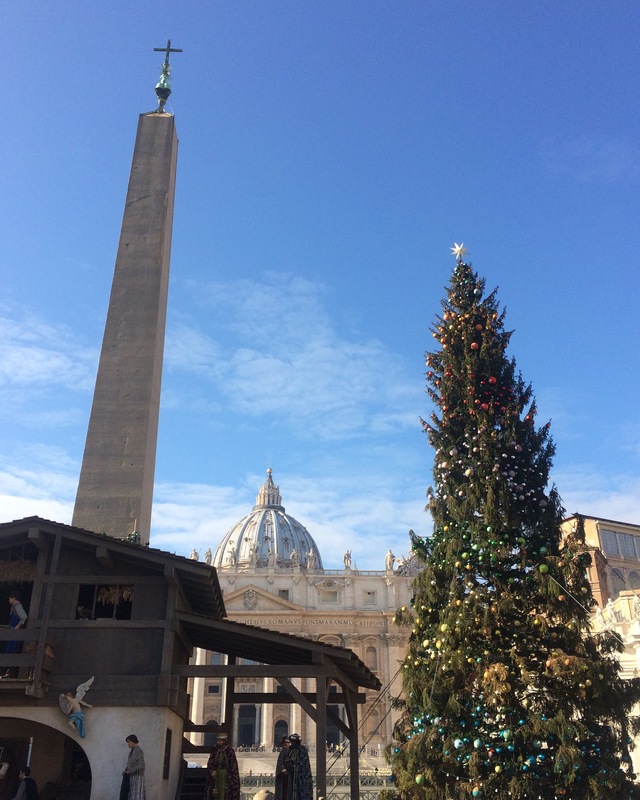 Happy Christmas and very best wishes for 2016 from Rome! At the heart of Federico’s Palace at Urbino, of which I spoke in my last post, was his studiolo, a tiny inner sanctum for study and reflection, and a place which served to advertise his erudition to visitors. Created by 1476, its lower level is clad entirely in elaborately detailed wood inlay while above hang 28 portraits of Illustrious Men (14 of the originals are here, the others are reproduced in sepia). Moses and Solomon rub shoulders with Aristotle and Plato, with Dante and Petrarch. Contemporary figures are also represented: Federico’s tutor Vittorino da Feltre is paired with Euclid, Pope Sixtus IV with Saint Albert the Great. Four of the Uomini Illustri. Clockwise from top left: Cicero, Seneca, Solomon, Moses. Justus of Ghent and Pedro Berruguete. The sepia image is a copy, the original is in the Louvre. The wooden intarsia, which employs over forty different types of wood and was the work of Benedetto di Maiano and his workshop, depicts an assortment of cupboards, left open in a studiedly casual manner to reveal their contents. Books, musical scores, and mathematical instruments jostle with weaponry. Federico advertises his military prowess and intellectual pursuits in an amusing manner which is itself an expression of his aesthetic credentials: he is au fait with the new techniques of linear perspective; in his unusual choice of materials for his study he is not following trends but setting them. Detail depicting, amongst other things, an inkpot, an astrolabe, and a rosary. His status is alluded to by the inclusion of the Order of the Garter, England’s highest chivalric order, awarded to Federico by King Edward IV. Next to it a scroll bears an inscription modified from Virgil, “through virtue, one shall reach the stars”, below which hangs a sword. Detail with Order of the Garter, scroll, and sword. Federico the intellectual rubs shoulders proudly with Federico the man of war. Federico himself is also shown, wearing a toga and in profile, his armour cast aside on a neighbouring shelf as though he has just returned from battle. To the right a squirrel gnaws a nut on a faux loggia, through which we view the rolling landscape of the Marche. If you are closer to New York City than Urbino, a similar room was made for the Ducal Palace at Gubbio. This was purchased, transported across the Atlantic, and reassembled at the Metropolitan Museum of Art in 1939. Mon 8.30-2, Tues-Sun 8.30-7.15 (ticket office closes one and half hours earlier). On the slopes of the Apennines, almost in the centre of Italy towards the Adriatic, is situated, as everyone knows, the little city of Urbino. … Among the blessings and advantages that can be claimed for it, I believe the greatest is that for a long time now it has been governed by outstanding rulers. … Without looking further we can find a splendid example in Duke Federico of glorious memory, who in his day was the light of Italy. … Among his other commendable enterprises, Duke Federico built on the rugged site of Urbino a palace which many believe to be the most beautiful in all Italy. 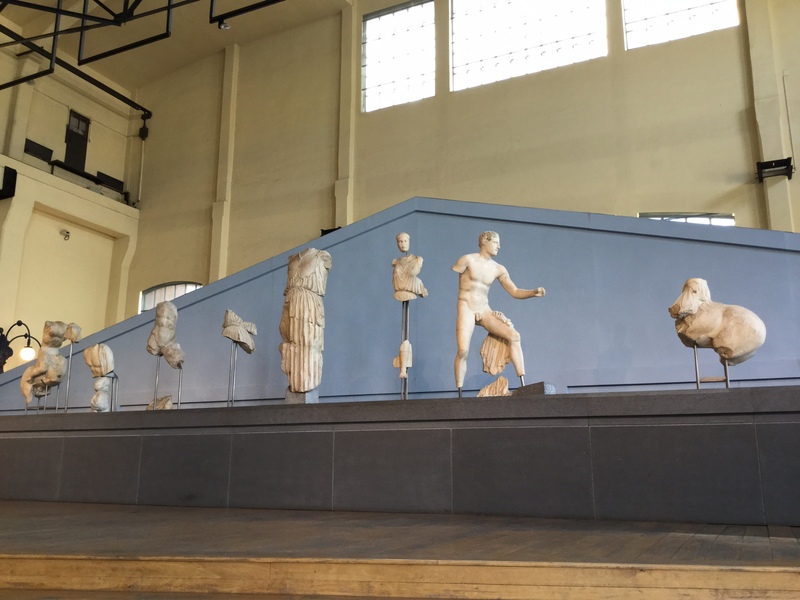 November is a quiet month in Rome for visitors, it’s a time in which I try to catch up on visiting exhibitions I’ve missed, areas of museums I don’t go to enough, and indeed this often neglected blog. A couple of weekends ago, after a trip to visit friends in the Cortonese Hills, I took advantage of a couple of free days to take a jaunt to Urbino. Glorious sunset near Cortona a fortnight ago. This small university city in the Marche region was the birthplace of Bramante, Raphael, and Barocci (not to mention Moto GP champion Valentino Rossi), and as Baldassare Castiglione wrote, its palace has been considered among the most beautiful in Italy. For a town of barely 20,000 inhabitants it punches above its weight. I’ve been once before, in the summer of 1998 when my objective was a spot of research for the university dissertation I was about to begin, and which would eventually have the title “Piero della Francesca: Architect?”. On that occasion a friend and I set off from Florence where we were spending a month (Italian classes in the mornings at the British Institute; long lunches and churches and getting lost in the afternoons). Owing to the not insignificant scale of the mountains between Florence and Urbino, our journey was fairly circuitous. At every turn our faltering enquiries were met with the sort of perplexed expressions that suggested this to be a barmy undertaking. This was, after all, in the distant pre-smartphone fin de siècle. Nevertheless we made it, via Bologna and Pesaro, by train and bus, to the cradle of the early Renaissance. This time things were altogether simpler; in the intervening two decades I have acquired, amongst other things, both a driving licence and a credit card. I was thus able to go through, and not round, the mountains in a small silver hire car. Then as now, my main objective was the Ducal Palace of Federico da Montefeltro, one of the great figures of the Italian quattrocento, and largely responsible for Urbino’s cultural micro-climate. Soldier of fortune and aesthete, ruthless conspirator and intellectual, he is most celebrated in a double portrait by Piero della Francesca in which he is shown nose to nose with his wife, Battista Sforza. Double portrait of Battista Sforza and Federico da Montefeltro, Piero della Francesca, c. 1465-72. Galleria degli Uffizi. The representation in profile, a device which harks back to ancient coinage, served to hide the Duke’s missing eye, lost in a jousting competition. The portrait also shows a distinctive ridge at the bridge of his aquiline nose, believed to be the result of surgery to increase the field of vision of his one remaining eye. Federico’s palace can also be viewed as a portrait of this most Renaissance of men. The project became ever more ambitious as he rose from Count, a title he had inherited at the age of 22 following the murder of his half-brother Oddantonio (you might think that, I couldn’t possibly comment…), to Duke in 1474, a reward dispensed by Pope Sixtus IV for his service as condottiere. Nearly twenty years ago, my tutor at Edinburgh University, Dr James Lawson, used terms to describe the aspects of his rule which the Duke expressed through his palace. These have always stuck in my mind. The first, looming over the hills of the Marche and the lands of the Montefeltro from his heftily fortified, but elegant, acropolis, is that of homo ferox; Federico presents himself to potential invaders as a man of war. Looking towards the city the (unfinished) facade is altogether less forbidding, here Federico shows himself as homo emptor, a ruler attuned to the needs of his subjects and the importance of commerce. The facade of the Ducal Palace at Urbino. Entering the palace from this side, one immediately enters a courtyard, usually attributed to Luciano Laurana, believed to have been the principal architect of the palace. It is here that the intellectual aspect of Federico’s rule expresses itself, in the calmly ordered classical proportions, precociously sophisticated in the mid-15th century, especially for a city the size of Urbino. Duke Federico, one of the ultimate Renaissance men, tells us that homo sapiens exists because of, and not in spite of, war and commerce. The courtyard of the Ducal Palace at Urbino. 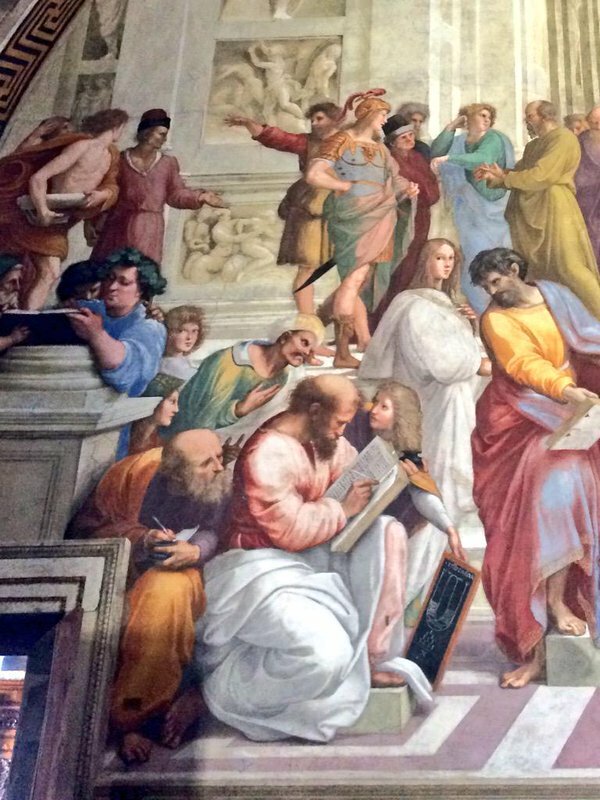 The School of Athens: Averroes and Pythagoras on the Pope’s wall. Negotiating the labyrinth of the Vatican Museums one runs the risk of running out of steam on the way to the Sistine Chapel. But do keep some energy in reserve for the Raphael rooms. In 1508, Raphael, then 26 years old, was called in by Julius II to decorate his personal apartments. Or rather, redecorate; Raphael and company were painting over frescoes by some of the greatest artists of the Italian quattrocento. The enormous antipathy felt between Julius and his predecessor, the notorious Alexander VI of the Borgia family (who looked less like Jeremy Irons than Showtime would have us believe), was such that upon his election Julius eschewed the apartments painted by Pinturicchio for Alexander. It was said that Alexander had attempted to poison Julius when he was still a cardinal; an event which appears to have rather soured their friendship. Alexander VI Borgia, Borgia Apartments, Vatican Museums. So it was that Julius chose to have the apartments of Nicholas V in the Vatican Palace repainted. The most celebrated, and deservedly so, of these rooms is the first to be painted, the Stanza della Segnatura (literally the Room of the Signature), Julius’ private study. From his desk Julius would have looked across to the opposite wall at the painting popularly known as the “School of Athens”, or simply as “Philosophy”. Amid a curious, half-finished architectural structure is a gathering of thinkers; a fantasy league of philosophers and mathematicians in one place and in one moment, regardless of when or where they did their thinking. 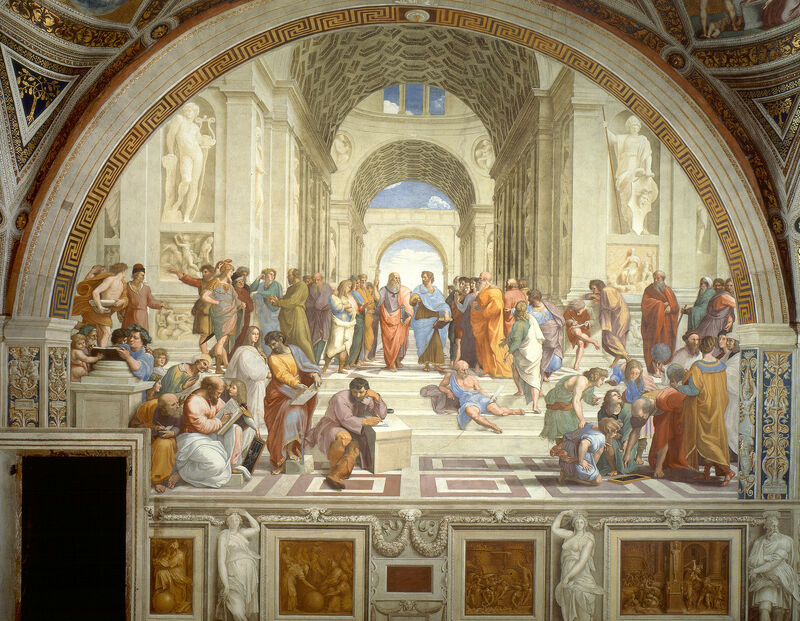 In the centre, wearing pink and blue cloaks respectively, are Plato and Aristotle. Plato points heavenwards and holds his Timaeus, Aristotle indicates the solidity of the material world and holds his book of Ethics. A few figures to the left, Socrates stands in an olive green robe, recognisable by his characteristic snub nosed portrait. He counts out the points of his argument to a young man in military attire who may or may not be Alexander the Great. It would certainly be neat if he were: for it was Socrates who taught Plato, Plato who taught Aristotle, and Aristotle who was engaged by Philip of Macedonia to teach the young Alexander. Indeed this is the overall theme of the painting which speaks of the passing on of ideas, of the transmission of knowledge. In the bottom left the bearded figure of Pythagoras in a pink robe writes in a book while a turbaned figure in a green cloak looks over his shoulder. School of Athens, detail. Averroes (turban, green cloak) looks over the shoulder of Pythagoras (pink cloak, large book). The top right hand figure is Socrates. This is Averroes, a Muslim Andalusian polymath active one and half millennia after Pythagoras’ death; we can safely say they never met. Which matters not a jot. Raphael’s painting is not concerned with prosaic chronology but rather is an exaltation of the sum of human knowledge. Indeed the study of Pope Julius in the early 16th century is decorated not only with Greek philosophers from the distant and pre-Christian past, but also with the figure of an eminent Muslim. The bridge between the mathematics of the ancient world and that of the sixteenth century, we are told, passes through the Islamic world. Julius tells us that the more one knows of the universe, the better one can glory God; that mathematics and astronomy are complementary, rather than contradictory, to religious belief. Six years after this room was finished, Martin Luther would begin the Protestant Reformation, and Rome’s divine supremacy would be called into question. Within a few decades people would be executed in the Campo de’ Fiori for claiming the Earth revolved around the Sun. The relative prosperity and stability of Julius’ reign allowed for a brief moment of enlightenment between the burning of witches and the burning of heretics. That the painting survives is down to its location in the private papal apartments; had it been in a public place it, and especially Averroes’ image, would never have survived the Inquisition. It is, like any great work of art, inescapably of its time; a keyhole through which we can peer into the mind of Pope Julius. Who I like to imagine looking on bemused, as we traipse through his private study. Mon-Sat 9am – 6pm (last entrance c. 4.20pm). Entrance 16 euros, 20 euros with reservations (advisable). 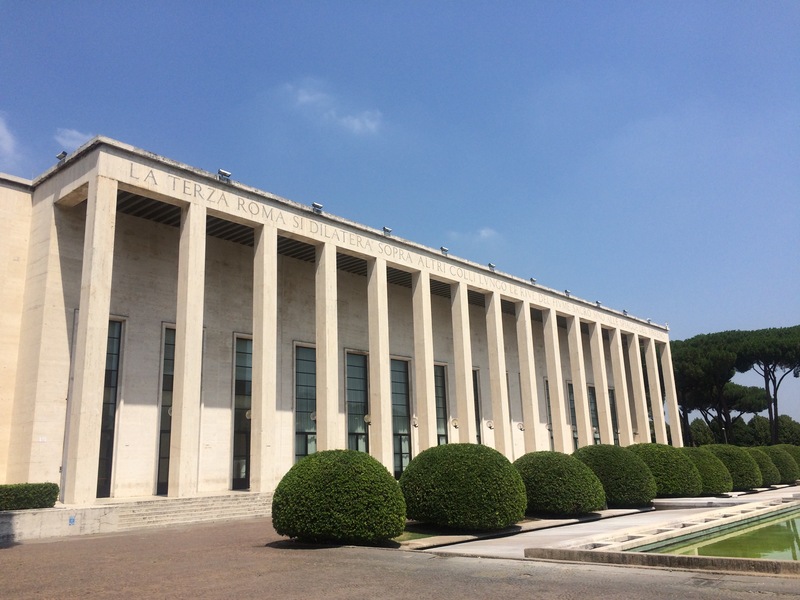 The Esposizione Universale di Roma planned for 1942 was to celebrate the 20th anniversary of Fascist rule. Initially known as E42, the project had begun in 1936, with construction on the buildings of the “new Rome” underway by 1938. As it transpired 1942 would see more pressing events and the EUR never took place. After the end of the war this Fascist era White Elephant was gradually turned to other purposes, especially government offices. The area was also one of the hubs of the Olympic Games held in Rome in 1960. In its desire for the sort of modernity favoured in the 1930s (& not only by totalitarian regimes) it is all vast boulevards and gleaming marble. Unlike the eminently walkable city centre it is not on a human scale. The monolithic architecture is best seen on a torrid weekend summer morning, ideally in August, when the deserted streets only serve to emphasize the unsettling oddity of this exercise in hubris. It always reminds me of the metaphysical paintings of Giorgio de Chirico. 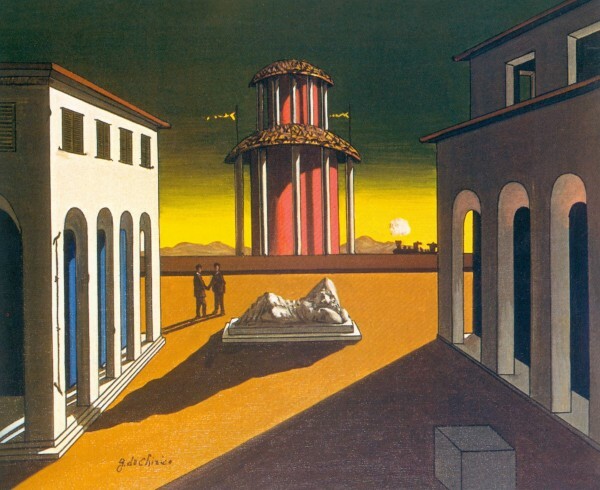 Piazza d’Italia, Giorgio de Chirico. Art Gallery of Ontario. 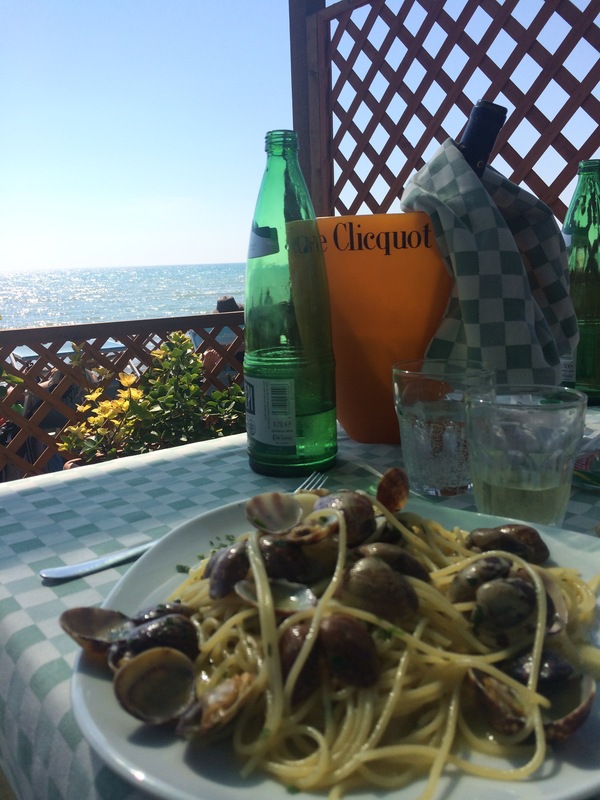 In summer months, and in the interests of balance, I suggest passing through EUR en route to the beach at Ostia, where any hint of metaphysical angst that may remain can be banished with a plate of spaghetti alle vongole amid the cheerful cacophony of the Roman seaside. I arrange tours of EUR which focus on the architecture of Fascism, either as a single itinerary or as part of a wider discussion of Fascist architecture. This could also include other sites, such as Piazza Augusto Imperatore, and the Foro Italico. Moving Mountains: A geological map of Empire at the Centrale Montemartini. A couple of weeks ago I was once again invited to be involved in Context Travel’s admirable series of Tours in the Public Interest. The focus of this year’s series is on museums which are regularly open to the public, but which get far fewer visitors than they deserve. 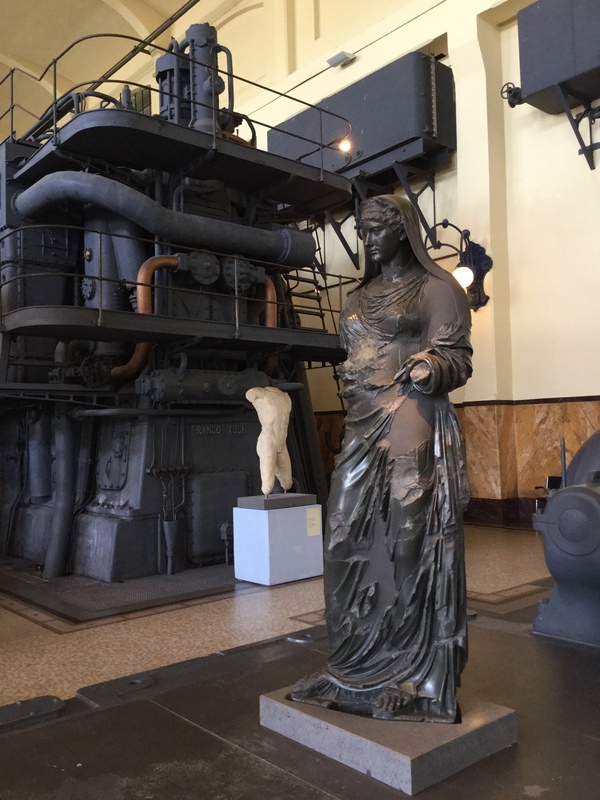 I chose the Centrale Montemartini (about which this from 2013), a former thermo-electric power station converted in the late 1990s into an outpost of the Capitoline Museums; a splendidly evocative juxtaposition of early 20th century technology and ancient sculpture. My brief was to choose three (ish) things, and a thread to connect them. Given the massive and material nature of the machines which provide the backdrop to the collection, I chose to consider the matter from which the ancient art displayed was itself made. The quality and types of stones used in Roman buildings, and in sculptural and architectural decorations, tell us a great deal about those buildings: their status, for whom they were made, and Rome’s fortunes at the time. 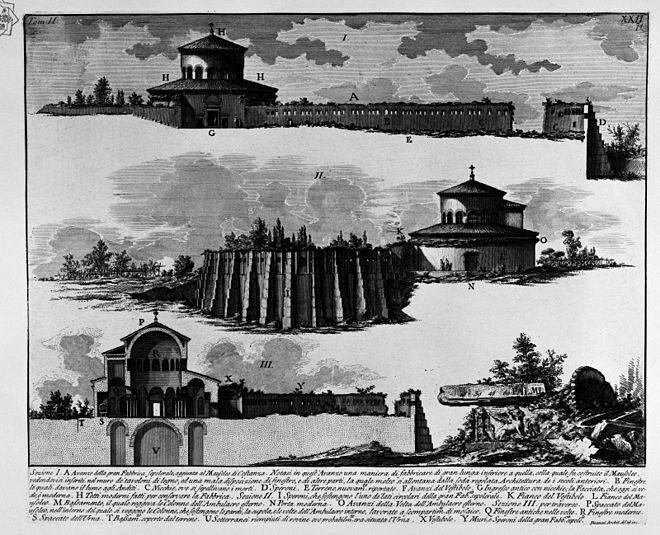 From the early use of rough local tufa (the compacted volcanic ash which forms Rome’s “seven hills”) to the importation of red porphyry from the eastern deserts of Egypt, the very stuff from which the city was built can be seen as a prism through which to view its expansions and triumphs. Chapter 36 of Pliny the Elder’s Natural History, the “Natural History of Stones”, is one of the great sources of information regarding the types of stones used in Roman decorations, even though Pliny himself is, with a rather waspish tone, disapproving of the fondness for exotic decorations which he describes as “the leading folly of the day”. (The 38 ft columns of Lucullan marble imported from Asia Minor for the house of M. Scaurus c.60 BC are described as “a first essay in vice”). Pediment sculptures from the temple of Apollo Sosianus. Parian marble. (Captive Greece took captive her own rude conqueror, and brought the arts to rustic Latium). Basanite statue of Agrippina Minor, found on the Caelian Hill in the late 19th century. This statue of Agrippina the Younger was found in the area of the temple dedicated to her husband (and uncle) the Divine Claudius on the Caelian Hill. She is shown in the guise of pious widow despite the assertions of several sources (Suetonius, Tacitus and Pliny for starters) that she had poisoned poor doomed Claudius with mushrooms. Thus she would place her teenage son by a previous marriage, Nero, on the throne. Five years after he came to power Nero would hatch an elaborate plot to murder his mother. All very Game of Thrones. The statue is made from basanite, an igneous volcanic rock rich in iron which takes its name from the Greek verb “to test”, an etymology which originated in Egypt where the rock was used as a touchstone. The quarries of basanite were at Wadhi Hammamet in Egypt’s eastern desert, and are mentioned in the earliest known geological map (now at the Egyptian Museum in Turin) drawn up for Rameses IV in the twelfth century BC. The early twentieth century building of the underpass behind Santa Bibbiana (a Baroque rebuilding of an ancient church with a sculpture by Bernini and frescoes by Pietro da Cortona nestling stoically amid railway lines) yielded a mosaic showing the capture of wild animals for the venationes (animal hunts) staged in amphitheatres. The mosaic dates to the fourth century and once decorated the opulent Horti Licinii, a sprawling villa/garden complex of great prestige on the Esquiline Hill which had belonged to the family of the third century emperor Gallienus. Even in a period of Imperial decline, its palette uses colours from the far reaches of Empire: serpentine of Greece, Numidian yellow from Tunisia, Aswan pink granite from Egypt and more. Rather as the lions and tigers and bears (oh my!) being captured evoked an sense of the exotic expanse of Empire to the citizenry at the Colosseum, so the art and architecture of Rome provide us with what we might think of as a geological map of Empire. 9 am – 7 pm, closed Mondays, 1 Jan, 1 May, 25 December. 7.50 euros, 16 euros for a combined ticket with the Capitoline Museums. 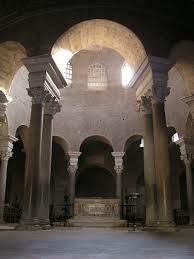 On the cusp of Christendom: The architecture of the mausoleum of Constantina. The first version of this post was written for the fabulous, but now sadly defunct, 3 Pipe Problem blog. It was run by the fearsomely energetic Hasan Nayazi who died suddenly and prematurely last year. I met him in person once, on his only visit to Rome two years ago, and I had the great fortune to visit the Villa Farnesina and the Vatican Museums with him, retracing the steps of his hero, Raphael. On the via Nomentana, two miles outside the walls hurriedly thrown up by the Emperor Aurelian between 271 and 275, is the place where the young martyr Agnes is believed to be buried. Her life (and death) is one of myth and contradiction. Tradition says she was executed following her refusal to marry a Roman nobleman. Whether this took place during the furious mid-third-century persecutions of Christians ordered by the Emperors Decius, Gallus, or Valerian, or perhaps those of Diocletian at the very beginning of the fourth century, is uncertain. These doubts notwithstanding she is a key figure in the early church, the Depositio Martyrum of 336 referring to the celebration of her feast day; the “XII Kal. Feb. Agnetis, in Nomentana”. She is clearly also a favourite of St Ambrose, who lauded her in his De Virginibus (337), his De officiis of c.391, and to whom the hymn “Agnes Beatae Virginis” is attributed. The Emperor Constantine’s legalization of Christianity, with the edict he issued at Milan in 313, saw a spate of church building in the capital. A series of “cemetery basilicas” were built close to the burial areas of the early martyrs. 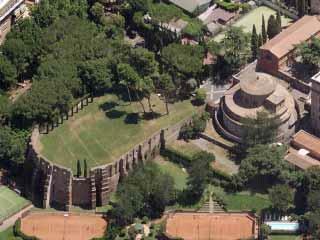 Often described as “circus-shaped”, they evoke the shape of the Roman race-track, rectangular at one end, semi-circular at the other (apse) end, with an ambulatory running around the edge. The floors of these basilicas contained large numbers of tombs on several levels, with the burial areas closest to the believed places of the martyrs being especially in demand. Sadly these cemetery-basilicas do not survive intact, but fragments of the fourth-century basilica of Saint Agnes (replaced by a nearby church in the seventh century) can still be seen, its scale especially visible from the modern piazza Annibaliana where buttressing supports the significant earthworks which had created the terrace from the hillside. The Liber Pontificalis (the book of papal biographies said to have been begun by St Jerome, but certainly later in date) refers in a sixth-century note to the church of St Agnes which it says was built by Constantina, daughter of Constantine. It speaks of Constantina “who is devoted to God and Christ [and] has with all humility taken all costs [for the building] upon herself and … dedicated this sanctuary to the victorious virgin Agnes”. The land on which the basilica was built was Imperial property, and Constantina also commissioned the construction of her own mausoleum here, abutting the long side of the basilica of St. Agnes and originally connected to it by an apsidal porch. The building of a mausoleum attached to a cemetery-basilica was not without precedent in the Imperial family; Constantina’s father Constantine had himself been buried in a mausoleum attached to the Basilica of the Holy Apostles in Constantinople, as had his mother Helena at the Roman basilica of Saints Marcellus and Peter on the via Labicana. The mausoleum was probably begun following the murder of Constantina’s first husband, her cousin Hannibalianus, King of Pontus and Cappadocia, in 337, and before her marriage in 351 to another cousin, Constantius Gallus. 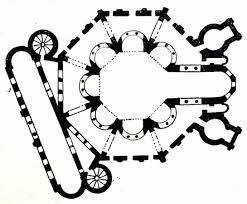 Modifications to the original modestly sized trefoil plan saw it enlarged, befitting a mausoleum for several members of the Imperial dynasty, and given the circular form we see today. These changes are believed to have taken place after Constantina’s second marriage, and before the death of her brother Constantius, probably the sponsor of the project, in 361. The fourth-century historian Ammianus Marcellinus speaks of Constantina’s body being buried on the Imperial property outside the city walls on the via Nomentana following her death in Bithnya in 351, when she would have been about forty years old. He also tells us that Constantina’s sister Helena was buried here in 360, further evidence that the grander scale of the mausoleum was designed with members of the family other than Constantina in mind. The building was certainly used as a church by the mid-ninth century, and in 865 it is referred to as a church dedicated to Saint Constance. If we are to believe the Liber Pontificalis, Constantina appears to have been a Christian, an interpretation absolutely supported by the location of her mausoleum. However there is no evidence whatsoever for her canonization, and she is no longer recognized as a saint by the Roman Catholic Church. Nevertheless it is the mausoleum’s consecration as a church, in great part the product of the confusion surrounding the figure of Constantina, which is at the heart of the building’s survival; as a church it was not only deemed sacred but was simply in use and thus not subject to the same levels of looting of materials that befell other structures. 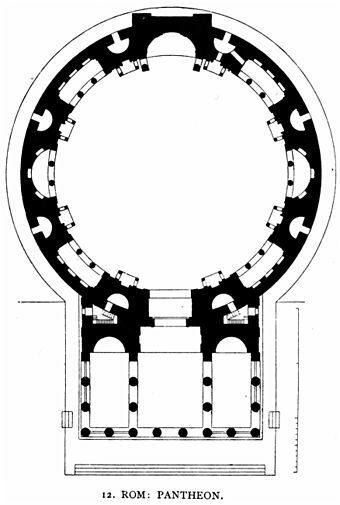 The building is circular, 22.5 metres in diameter, with a central concrete dome resting on a clerestory above a ring of twelve pairs of columns with composite capitals. That these capitals are not exact matches, and were “recycled” from earlier structures belies the decline that Rome found herself in. Some two decades after Constantine had founded Constantinople as his new administrative capital in a desperate bid to reclaim control of the fragmenting eastern provinces, the Caput Mundi was feeling the strain. Most of the illumination which is such an important part of the building is provided by twelve windows set into the drum of the dome, one above each of the arches. The ring of columns is surrounded by a barrel-vaulted ambulatory with fourteen niches inset into the exterior wall. Originally a colonnaded portico (which no longer survives) ran around the exterior wall. Like the portico around a classical temple it did not offer access to the interior, but rather served both structurally as an additional support (in this case for the concrete dome), and ideologically as a buffer zone between the worldly and the sacred. Also now missing is the entrance porch which archeological investigations have revealed, like that of the early fourth-century temple of Romulus in the Roman Forum, to have been convex in form. The mausoleum of Constantina can be seen as heir to a long tradition of centrally-planned funerary structures. Circular and conical forms are among the most archaic (piles of stones to mark an important location; the huts of the Bronze Age). This atavistic architectural impulse, coupled with the elegance of the circular form, and its innate connotations of the infinite, led centrally planned buildings to become associated in a Christian context not only with martyria but also with baptisteries. Two centuries after the construction of the Pantheon, at the mausoleum of Constantina we witness an important moment in the development of the centrally-planned building. The study of the floor plans of the buildings along this journey can be viewed as stills from a time-lapsed film of biological development. We begin with the purely cylindrical (tumuli, Cecilia Metella) before the space gradually opens out (Mausoleum of Hadrian), and begins to be alleviated by a series of niches (reaching its apotheosis at the Pantheon). These niches then continue to reach outwards, breaking through the perimeter wall like buds on a dividing cell. They leave behind the dots of columns which trace the original cylindrical form and support a vaulted ambulatory around the domed central space. This ambulatory (which one can consider as a sort of circular aisle) is a new development in Roman architecture, and its earliest surviving form is seen at Santa Costanza. Through this organic development a structure develops in which, as in nature, every element works together as part as a coherent whole. Like all great buildings it is governed by its past, but is also charged with a present which both defines and enriches it. The mausoleum of Constantina thus heralds a key point in the ever greater ornamentation and dilation of space which paves the way for the centrally-planned place of Christian worship, as would be seen at the rotonda of the Anastasis at the Church of the Holy Sepulchre in Jersualem (dome completed late fourth century), and at San Vitale in Ravenna (completed 546). When Bramante created what is now seen as the first building of the High Renaissance over a millennium later, the Tempietto of San Pietro in Montorio, he turned once again to the harmony of the central plan. A celebration of bread, cakes, beer, and grain-based foods.